* Nancy Povey with members of the Aroha Choir. A former Llangollen souvenir shop owner who made it her mission to visit the town’s International Musical Eisteddfod every year was over the moon when one of the most colourful and melodic acts from this year’s event gave a concert at the care home where she now lives. 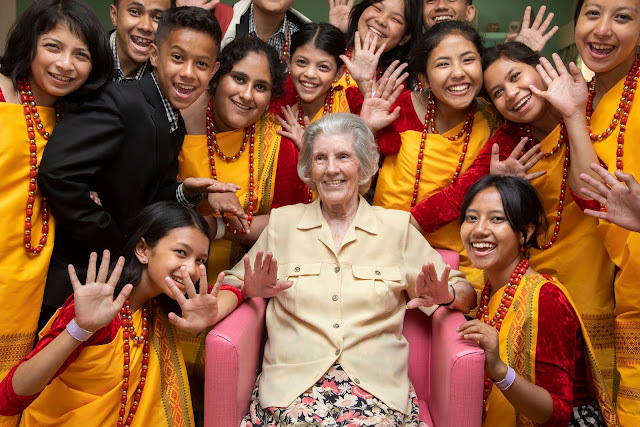 Nancy Povey, 90, a talented pianist and music lover, said she was delighted to listen to the Aroha Junior Choir perform for residents at Hillbury House Care Home, Wrexham. The choir hail from Shillong, the capital of Meghalaya province in north east India and this year is their first visit to the annual festival at Llangollen which attracts competitors from all over the world and promotes the message of peace and friendship through music and dance. Chatting to the choir members while posing for a photograph with them Nancy told them after their performance that from now on there would always be a welcome in Wales for the Aroha choir. She said: “This year is the first year I haven’t been able to get to Llangollen International Musical Eisteddfod. I would always go every year. I love it listening to musicians from all around the globe. The Aroha choir were in turn thrilled to be asked to deliver an afternoon performance for residents of Hillbury House, which is part of Pendine Park Care Organisation, a key sponsor of Llangollen International Musical Eisteddfod. The choir comprises young people aged from 11 to 19. About 20 choir members, leaders and some of their parents made the trip after a long fundraising campaign to pay for the journey to Wales. Among the parents who came from India were Toony Gill, whose daughter Denise, 15, is a choir member, and AJ Lynrah, whose son Aryan, 14, sings in the choir. Choir director and conductor Pauline Warjri said they had rehearsed for many months for their visit. Pauline and choir member Venetia K Warshong, 16, went out of their way to deliver an extra special rendition of Amazing Grace for the Hillbury residents. It is not normally on the choir’s repertoire but when one of the residents, Dianne Morris, 69, asked for it, Pauline and Venetia performed an impromptu duet of the classic hymn. The choir, dressed in vibrant red and gold costumes, performed traditional folk and spiritual songs a capella including Ezekiel Saw the Wheel, a medley of Disney musical favourites, which featured Let’s Go Fly a Kite and hymns including I Need Thee Every Hour. Their performance brought tears to the eyes of care assistant Ellen Griffiths, who said the young singers had some of most beautiful voices she had heard. Hillbury residents gave the choir a rousing cheer at the end of their concert and spent time chatting with some of the choir members about their musical heritage. They also had photographs taken as a memento of the occasion. One resident, Margaret Newell, 96, delighted in having a selfie photo taken with choir member Mason Mario.